This northern unspoiled location offers genuine warmth and friendliness of the Fijian people, beautiful lush tropical surroundings, and warm, impossibly clear waters. Revitalize, refresh, renew. A native experience awaits you at Koro Sun Resort. Born of a nature lover’s dream, the resort springs forth from a magnificent coconut plantation, encircled by lavish rainforests, at the edge of a stunning private lagoon. The 150 acres offers guests a welcome respite from the busy world. Our 29 enchanting bures are private, exclusive and fully air-conditioned, and offer all-encompassing views of the ocean and reefs beyond. Your stay is all-inclusive - from the tenderly prepared and presented gourmet feasts, to the meticulous attention you receive from the dedicated staff. All non-motorized water sport activities are included, so the world outside is yours to discover. Ocean View Garden Bure - Surrounded by lush tropical gardens with picket fences, each bure is air conditioned, offering one king bed and a romantic outdoor stone shower. Sleeps 2. Ocean View Two-Bedroom Bure - 2-bedroom, 1 bath bure is air conditioned with a private porch area and day bed, indoor bathroom, and outdoor stonewall shower. Deluxe bure is also available. Sleeps up to 5. Raintree Bure –. 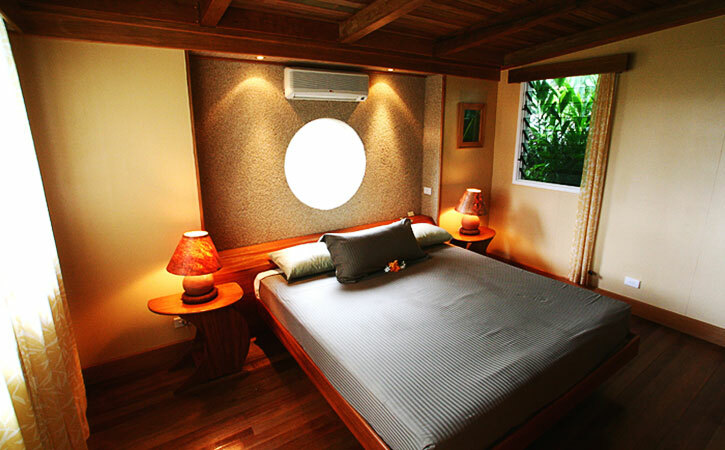 2 Bedroom, 1 bath bure is nestled in the gorgeous Fijian rainforest. Perfect for families, singles or groups, features a Queen-size bed, 2 Twin beds and an elegantly appointed living room with day bed. The indoor bathroom has two showers (one is an outdoor garden stone shower), a full kitchen, screened-in porch area, plunge pool and patio with views of the rainforest and the Koro Sun Golf Course. Sleeps up to 4. Treetop Honeymoon Bure - 2-story octagonal bure offering over 1000 square feet of fully furnished interiors in handsome teak and palm wood furniture with fully stocked mini bar and DVD player.. The second floor master bedroom offers an over-sized, built in bed, with 360-degree panoramic views of the ocean, golf course and rain forest. The circular surrounding deck with private plunge pool and outdoor shower offers stunning views from every angle. The master bathroom offers a private spa tub and shower. Koro Sun’s dive sites include the world famous Namena Island Marine Reserve, which is perhaps the most prolific and beautiful dive site in all of Fiji. You can enjoy an underwater Fiji adventure at the awe-inspiring Rainbow Reef in the Somosomo Straits, which have earned the proud moniker, "The Soft Coral Capital of the World." Several pristine sites are available locally, including Dreamhouse, Pyramids & Purple Garden. All are accessible within minutes of the Koro Sun Resort and dive shop. Whether you are an experienced diver, or looking to take the plunge for the first time, Fiji's Koro Sun is the place to do it! With their warm Fiji waters and fun, dynamic staff, they offer a chance to explore the undersea Fiji environment in a way unlike any other. Koro Sun offers PADI and SSI Certifications, and once you've receive your accredited certificate, you can dive anywhere in the world. They also offer advanced levels of certifications, including Divemaster courses, perfect for the advanced diver looking to complete training. Purchase multiple dives in advance for a nice discount and substantial savings. KoroSun Dive is a PADI and SSI certified SCUBA diving operation, with a fully equipped dive shop and two 10-meter custom-built dive boats. Their professional staff provides introductory SCUBA instruction, full certification and advanced courses, as well as Rescue Diver and Divemaster programs. They generally offer a 2-tank morning dive, departing at about 8:30 a.m. and returning to the resort by lunchtime. Additional dives and day trips may be available depending on diver interest and weather conditions (see below for details). Towels and refreshments are provided at surface intervals. At the Fiji Dreamhouse dive location, you'll find a world of wonder with everything a Fiji diving adventure should include beautifully clear waters, and enough marine life to get your adrenalin pumping. View hundreds of barracuda, as you swim alongside Batfish to depths of up to 20 meters. Don't be surprised if your Fiji vacation becomes a shared experience with a few underwater natives: Hammerhead Sharks, Black Tip Sharks, Tiger Sharks and possibly Killer Whales. If you own an underwater camera, bring it! If you don't, will you ever have a better reason to buy one? The Fiji Purple Gardens are full of hard and soft corals, perfect for exploration and admiration. You'll see a variety of tropical fish species, all reminding you of the many wonders of our world that await your discovery. To say the least, after diving in Fiji, you'll have a new list of "favorite things." The general dive depth is near 20 meters, yet rapid drops below sea level can grow to depths of over 200 meters. One of Fiji's most exhilarating diving spots, the White Wall offers a dive entrance through a tunnel of soft coral. Once you swim through the entrance, you'll notice the depth grow to 30 meters, and be introduced to the wall a surrounding world that explodes with color. In the hopes of witnessing some of the most beautiful places in the world on your Fiji vacation, you may not have planned to find them underwater! White Wall is home to native fish, such as the social Manta Ray. You'll enjoy sharing the waters as you swim amongst the beautiful orange, pink, purple, blue and green soft corals. Fiji's Rainbow Reef is truly one of the breathtaking spots to dive in the Fiji Island. Allow the current to carry you as the bountiful and brilliant soft coral dazzles. Share the underwater world with the local marine life: Dog Tooth Snappers, Maori Wrasse, Blue Ribbon Eel, Scorpion Fish, Lion Fish, Barracuda, White Tip Reef Shark, Black Tip Reef Shark and many more who call this reef area "home." At the Koro Sun Resort, the Rainbow Reef is among our favorite Fiji diving adventures. Fiji's Golden Nuggets may sound like a kid's meal of deep-fried chicken, but not when headed for a Fiji diving adventure. The yellow soft coral gives this dive spot its name, and as you explore the 18 meters below, you'll see several native sea creatures, including Scorpion Fish, Sand Eels, White Tip Reef Sharks and Sea Anemones. A World -lass Fiji dive site, this Koro Sun Fiji diving adventure is a truly captivating experience. Enjoy deep waters at "Grand Central Station," including a gorgeous wall of soft corals at 20 meters and a world of sea residents swimming with you. Manta Rays, Sting Rays, Black Tip Sharks, White Tip Sharks and Bull Sharks are the prominent residents of this reserve area. At Fiji's Namena Island Marine Reserve, you'll also take pleasure in the "Chimneys." Two incredible, underwater pinnacles are split by a 40-meter break. You can spiral down the first, exploring the depth and native marine life, and then spiral up the second. Enjoy a leisurely and exciting experience in underwater exploration. A great location to enjoy some shallow Fiji diving, perfect for divers working toward certification, or exploring the natural sea for a second time. The site is full of hard corals, as well as many fish and magnificent sea turtles. This Fiji cave dive highlighted with hard and soft corals is perfect for enjoying the twists and turns in Fiji's underwater world. Devil's Hideout is a great, relaxing dive for a Fiji vacation adventure. Koro Sun also offers great dive package specials!